Commissioned by The Broadcaster. 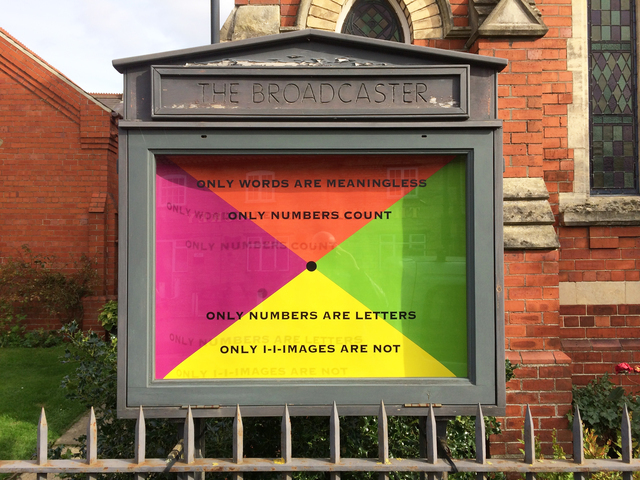 The Broadcaster project consists of two permanent notice boards located outside converted chapels in villages in rural Lincolnshire; Waddington and Wellingore. Each notice board is a venue for exhibitions curated by the Postmethodists. The aim is to develop and disseminate contemporary art in the everyday. By using established means, an innovative model of the distribution/dissemination of challenging/innovative art will be created in Lincolnshire. Both boards are situated on the Viking Way which is a heritage footpath extending through the county and is a destination for many national and international visitors, particularly during the summer months. The Work consists of a brightly coloured back ground over which vinyl text is placed on glass. The piece continues the exploration between text/language/sign/image that has been a large part of Dutton's work over the last decade.